Genevieve Plaster, M.A. | July 19, 2016. Last Wednesday, the House of Representatives voted to pass the Conscience Protection Act of 2016 (S. 304) by 245-182. In light of egregious cases of prolife nurses being forced to assist in abortions, prolife employers – including churches – in California and New York being mandated to provide coverage of abortion in health plans, and privately funded prolife pregnancy resource centers being required to advertise abortion, this bill’s passage in the House is an important step towards more effectively protecting the civil rights of Americans who do not wish to participate in the abortion industry. Though conscience rights laws already exist, the Conscience Protection Act is necessary for two main reasons. It would make permanent the protections of other laws such as the Weldon Amendment which must be renewed each year, and it explicitly states that victims of discrimination due to conscience have a private right of action – that is, can file a civil lawsuit – which is currently not the case. As it is, individuals can only file a complaint with the Office of Civil Rights (OCR) under the Department of Health and Human Services (HHS) and then wait for OCR to determine if the complaint is indeed a violation of the law. Recent events have made it clear that this protocol is woefully inadequate. This June, after almost two years of investigation following complaints, OCR decided to uphold a California mandate requiring all health plans in the state, including those provided by churches and prolife employers, to cover elective abortions. Though the Weldon Amendment prohibits federal money from going to states that discriminate against health care entities that choose not to provide, refer for, pay for, or provide coverage of abortion, OCR reinterpreted the law, arguing that it applies only to the health insurance companies who did not file complaints. Medical students tell me frequently that they are interested in ob/gyn, but they won’t train in it because they don’t want to be forced to kill unborn children. No wonder there is a shortage of ob/gyn and costs are rising. On paper, federal and state conscience laws protect rights of conscience. But these students see the grim reality — those protections are worthless without a right of action when the Administration refuses to enforce the law. 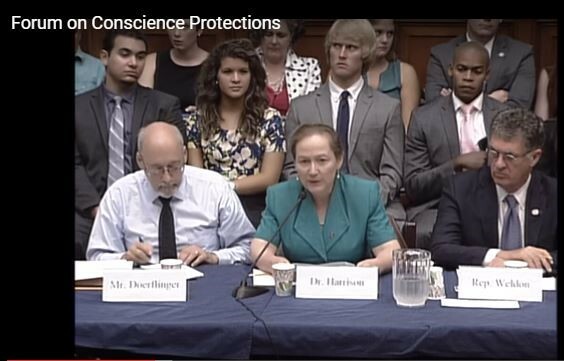 Dr. Donna Harrison, CLI Associate Scholar, speaking at the House Energy and Commerce Forum on Conscience Protections. America was built on freedom. “No provision in our Constitution ought to be dearer to man than that which protects the rights of conscience against enterprises of the civil authority,” wrote Thomas Jefferson. Two hundred years later, these words remain as relevant and pressing as ever. During a time when Americans are being forced against their conscience to participate in abortion, the Conscience Protection Act of 2016 proves to be indispensable.